The Grape escapade is Goa's answer to your Wine quests and comes with a lot of Grape expectations, ahem great expectations. This time around I got invited to sample some of the wines by the Zampa Grover vineyards. These guys have twin locations at the Nandi hills in Karnataka and Nashik Valley, thus giving them the beneft from the best in the country. 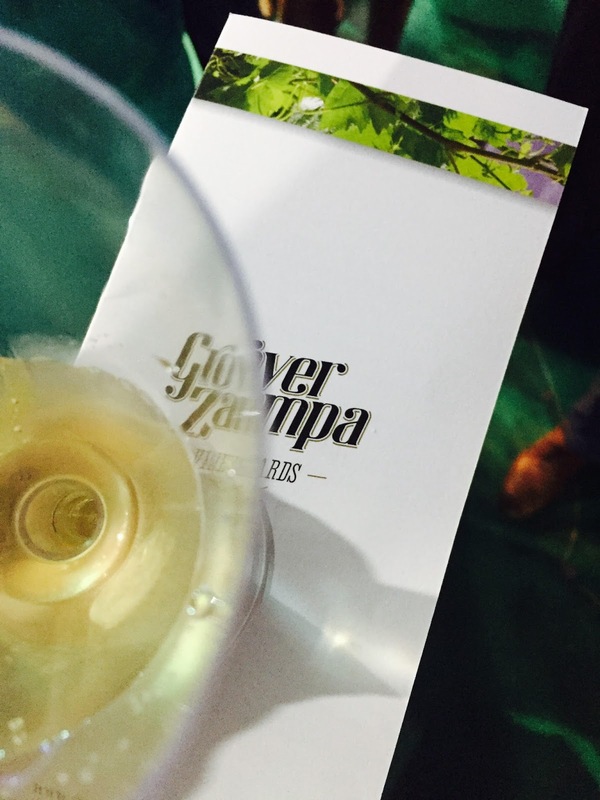 Zampa and Grover were two wine houses which have now merged to give us some stellar award winning wines. We tasted a whole lot of them but I will share the really good ones with you here. First off the Grover La reserve which is a blend of Cabernet Sauvignon and Shiraz. It is a deep purple burgundy colour and has been aged in french oak barrels for at least 6 months. 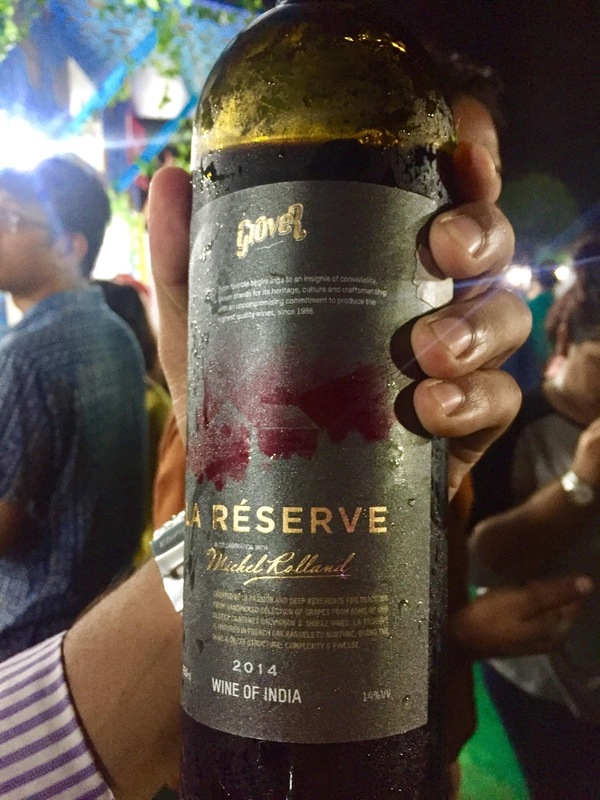 This is also the best red wine in the country claimed by Hardik our guide and wine connoisseur of the evening. of the 82 wine awards that the company has won, 40 of them have been for this lady in red. A sure fire winner, this is the perfect gift for someone who loves a red wine.they even export it to the wine drinking capital of the world, in France. 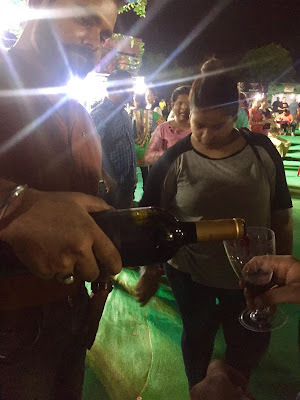 We also tried the Sante Shuraz, which was a floral spicy red wine perfect for Sangrias. It comes in a bottle inspired by Mario Miranda paintings, and it is a very affordable red wine, which delivers more than its price range. pouring wine into disposable but also keepsake wine glasses. I love a little bubbly, and the sparkling wines were both very good. Infact Hardik informed us that the techniques used were the same as used to make Champagne in France. except for the use of Indian grapes, this one is as close as you could get to the region. the Zampa Soiree Brut, and the zampa Soiree Brut Rose, both are excellent celebratory drinks. the bottles look elegant . The presence of the fine bubbles and a persistent mousse meant that the carbonation was natural and the subtle yeasty character was because it had been fermented over yeast . A dry finish , clean fresh flavours made these wines a favourite. 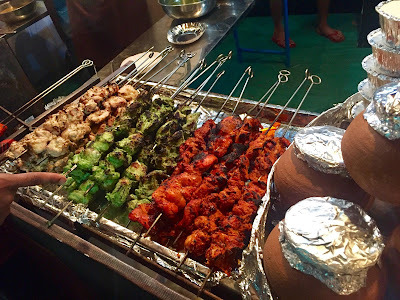 the Grape escapade organised by Goa tourism also boasts tons of eateries, and the kebabs at Mughlai munch were perfect with the wines. so do the crab sticks from the Gadre store. The art collection is the medium range wines from the house of Zampa and Grover. They are essentially non aged wines, which are prepared in a unique and arty version, the bottles each have a painting by the great masters from the world of art. 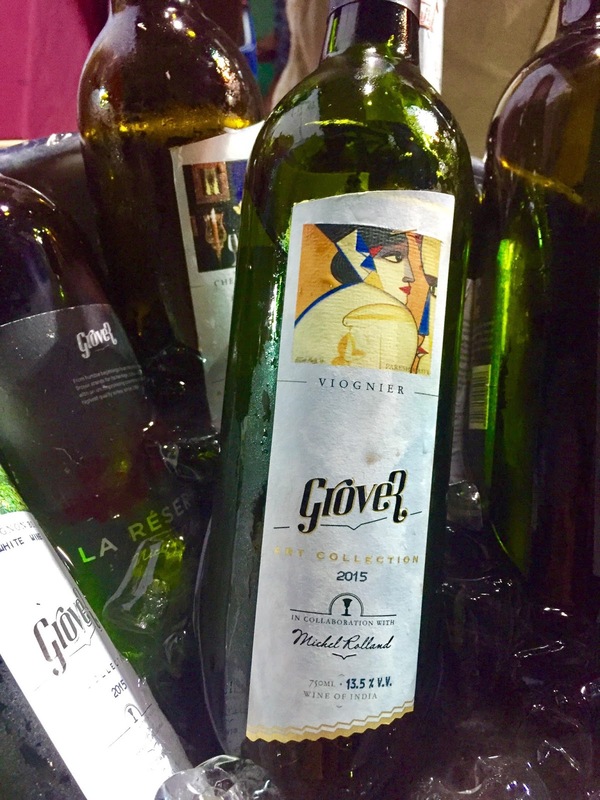 From Chenin Blancs, and Sauvignon Blancs with herbaceous notes, to the Viognier wine with increased viscosity and verve, to the reds of an arty Merlot, Shiraz and a Cabernet Shiraz, there is a lot to tempt the palate and gladden the heart.